With the courtesy of St Barth Fly Cam team, you can now experience a drone video of a speed demon race, which was held at St Barth in 2015. Here’s another mesmerizing drone video released by Lemon Drones. This video features an awesome drone footage capturing some perfect shots of water surfing race from the sky at St Barth. Lemon Drone is a well-renowned blog whose work is basically based on flying drone. Whether it by manufacturing one or releasing some amazing videos taken from flying drones. In this video, you can experience a fantastic race footage taken with the help of a hi-tech flying drone and with a marvelous soundtrack “Radioactive” playing in the background; this video has surely turned radioactive towards the end. Capturing the lovely waves of St Barth using a flying drone is a perfect way to appreciate it. One can experience some of the coolest angles from where the shots have been taken. It can prove to a one time experience as you might have not ever witnessed coolest footage like this ever. Definitely, the video has the capability to inspire everyone to get a flying drone for themselves and explore the world from different angles. Watch dozens of aquatic speed demons race in St Barth. Listen to the soundtrack “Radioactive” by Imagine Dragons as these guys fly over water. Captured by the St Barth Fly Cam team. 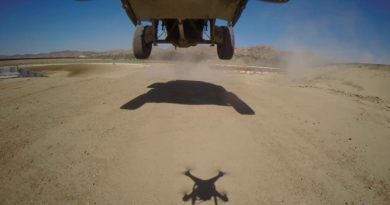 Although capturing videos with the help of a flying drone can really prove to be a difficult job but as you have a full control over your drone, you might be able to provide a different perspective to a video. Just like in this video, where the St Barth Flying-Cam team has managed to do so which was practically impossible without taking shots from a helicopter. A flying drone is what exactly you need to own right now. No need to hire a helicopter or some expensive team of professionals to do your job. Well, this can offer you some of the best videos for yourself in the time of need.